Angela Andersen has made over 50 documentaries in her career, most of them for German television. Documentary filmmaker Angela Andersen has been traveling the world for 35 years, reporting stories that illuminate global issues such as hunger and thirst, post-traumatic stress disorder and the atomic bomb. During her career she has directed and produced over 50 television documentaries, many of them for German television. 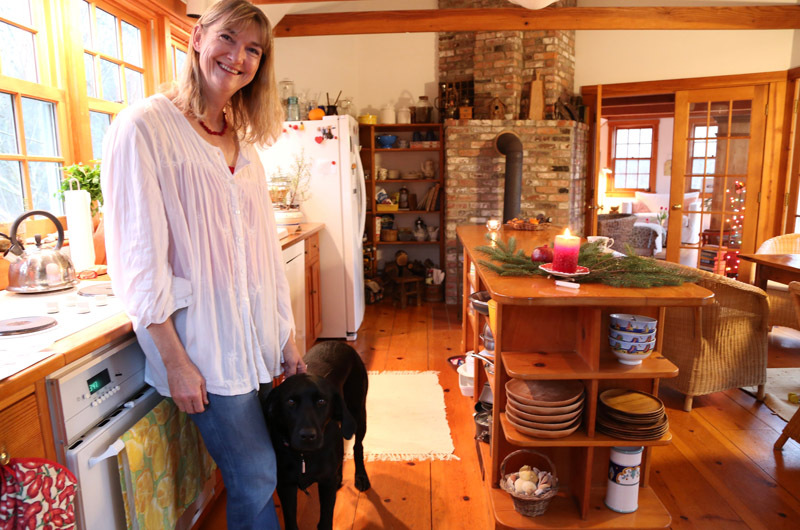 Originally from Germany, where her freelance career is based, Ms. Andersen spends as much of her time as possible on Martha’s Vineyard, where she has owned a home in West Tisbury since the mid-1980s. The American journalist’s brother turned out to be Travis Tuck, the celebrated metal artist who died of cancer in 2002. The prophesy about it being hard to leave the Vineyard did come true, and the young couple purchased land on Merry Farm Road 32 years ago. 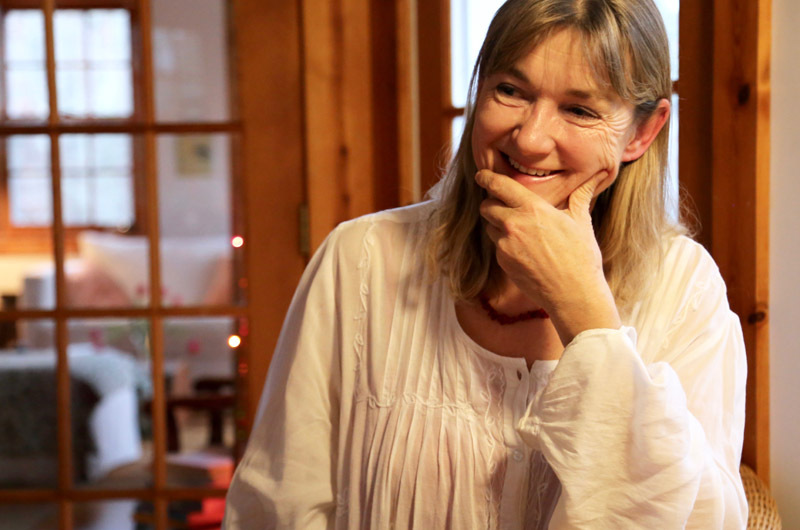 This past Thursday evening, Ms. Andersen merged her work with her adopted home by screening her latest documentary, Brave New World, at Pathways Living Room Studios in Chilmark. Dubbed and subtitled for English-speaking audiences, the 60-minute program takes viewers into the universe of Silicon Valley innovators who are developing new technologies faster than lay minds can comprehend the consequences. This posed a challenge that she met in part by hiring a graphic designer to illustrate concepts on-screen, like Brave New World’s totemic animal: a gigantic, galloping unicorn representing the Valley term for a start-up business valued at $1 billion or more. Despite the industry’s reticence, Ms. Andersen and longtime onscreen collaborator Claus Kleber secured interviews with a remarkably wide — if overwhelmingly male — variety of people in the tech economy, from the man who developed the self-driving car to an Uber driver who works 18 hours a day to support his family. In order to talk with Google X laboratories leader Astro Teller, Ms. Andersen said she dropped the name of his grandfather, Hungarian-born American physicist Edward Teller, whom she and Mr. Kleber had interviewed for a documentary 25 years earlier on the long-term health effects of bomb tests in Micronesia. Amazon, Apple and Google all said no to her requests to film and interview janitors and other support staff, Ms. Andersen said. But after a late-night Uber request for a ride from the San Francisco Airport, she met driver Resty Mendoza, who was migrating from Los Angeles for three weeks a month and sleeping in his car in order to earn a higher Uber rate in San Francisco. Over the course of several months, Ms. Andersen spent more time with Mendoza and filmed a protest by Uber drivers against cuts in their share of ride fees. She came up with the idea of producing Brave New World, she told the audience at Pathways, because “Silicon Valley touches us all.” Because the innovations developed there have global effects and consequences, “we need to engage. We need to go see what’s going on,” she said. Four million people in Germany have watched Brave New World since it first aired over the summer, Ms. Andersen said. The program is also being downloaded and shown on college campuses in Germany, where “we have a lot of regulations and restrictions. Many of the young people are fleeing. Silicon Valley is such a magnet, because those brains feed on each other,” she said. After the Pathways screening, Ms. Andersen took questions and comments from audience members, some of whom voiced concern, suspicion and even disapproval — not about the film, but about the culture it depicts. The technocrats “really have very good sales arguments” for their innovations, Ms. Andersen told her audience, but that’s all the more reason to scrutinize them. I've worked in tech since 1983 and Silicon Valley has been the secret sauce that has allowed this country to lead the high tech world in many new industries. The obsession with secretisim and security is foundational to the success of the Valley, as most innovation has a short shelf life, often less than 2 or 3 years. We shouldn't be doing anything except supporting the creativity and innovation coming out of this prolific culture. It creates millions of jobs and staggering wealth all of which could easily move off shore if we don't protect this haven and system of innovation.